I have had an idea for the opening scene of Amazon Prime’s in-production fly-on-the-wall documentary about Manchester City’s 2017/2018 season. It begins with a sombre warning from a US TV news reporter from 2009: “A reminder that what you are about to see is extremely violent and disturbing.” Then an ominous pause followed by some menacing music as they introduce the grainy footage of Sheikh Issa bin Zayed Al Nahyan using a cattle prod on a former business partner who is being held down by police officer somewhere in the desert outside Abu Dhabi. The menacing music gives way to the sound of Manchester City supporters hailing their owner Sheikh Mansour bin Zayed Al Nahyan — Sheikh Issa’s brother — to the tune of kumbaya. “Sheikh Mansour m’lord, Sheikh Mansour,” roars the crowd as we see Issa beating the man with a board with a nail protruding from it, pouring salt into his wounds, electrocuting him, and setting him on fire. At this stage the producers must resist the urge to lighten the mood by showing some exquisite interplay between Kevin de Bruyne and David Silva. 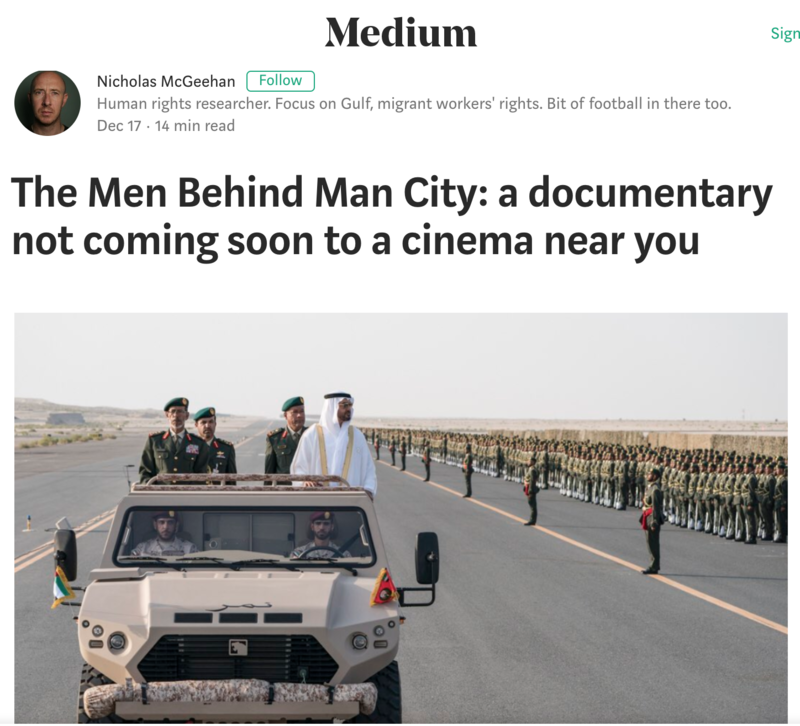 Instead the camera follows Sheikh Issa driving repeatedly over his victim in a Mercedes SUV, as City supporters continue to acclaim the royal family of Abu Dhabi, whose money has financed their rise to the top tier of European football.